Size of this preview: 502 × 600 pixels. Other resolutions: 201 × 240 pixels | 402 × 480 pixels | 643 × 768 pixels | 857 × 1,024 pixels | 3,245 × 3,877 pixels. from one of the B-29 Superfortresses used in the attack. العربية: صورة لسحابة عيش الغراب الناتجة عن الأنفجار النووي عند إلقاء قنبلة "الرجل البدين" على مدينة ناگازاكي اليابانية سنة 1945 اثناء الحرب العالمية الثانية. Deutsch: Atombombenabwurf mit einer Boeing B-29 Superfortress auf Nagasaki am 9. August 1945. Der Atompilz stieg 18 km hoch. 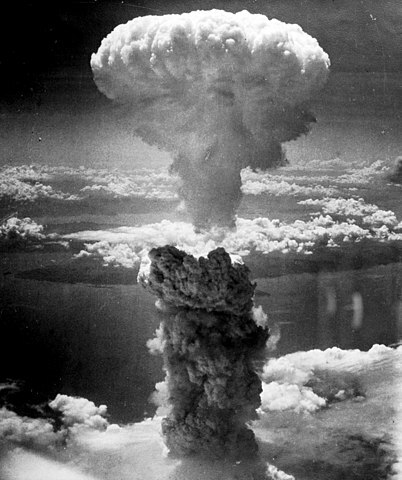 English: Mushroom cloud above Nagasaki after atomic bombing on August 9, 1945. Taken from the north west. Русский: Атомная бомбардировка города Нагасаки 9 августа 1945 года. Français : Le champignon atomique sur Nagasaki est monté jusqu'à une altitude de 18 km. Nederlands: Paddestoelwolk boven Nagasaki na de aanval op 9 augustus 1945. Genomen vanuit het noordwesten. Română: Ciuperca atomică de la Nagasaki, Japonia, 9 august 1945. Svenska: Atombomben över Nagasaki resulterar i ett svampformat moln som sträcker sig över 18 km upp i luften. Scope and content: Original caption: A dense column of smoke rises more than 60,000 feet into the air over the Japanese port of Nagasaki, the result of an atomic bomb, the second ever used in warfare, dropped on the industrial center August 8, 1945, from a U.S. B-29 Superfortress. This media is available in the holdings of the National Archives and Records Administration, cataloged under the National Archives Identifier (NAID) 535795. This image is a work of a United States Department of Energy (or predecessor organization) employee, taken or made as part of that person's official duties. As a work of the U.S. federal government, the image is in the public domain. Please note that national laboratories operate under varying licences and some are not free. Check the site policies of any national lab before crediting it with this tag. English: This image was selected as a picture of the week on the Malay Wikipedia for the 44th week, 2009. Македонски: Сликава е избрана за слика на неделата на малајската Википедија за XLIV недела од 2009 година. മലയാളം: മലയ് വിക്കിപീഡിയയിൽ ഈ ചിത്രം ഈ ആഴ്ചയിലെ ചിത്രമായി 2009-ലെ വാരം 44-ൽ തിരഞ്ഞെടുത്തിട്ടുണ്ട്. Bahasa Melayu: Imej ini merupakan gambar pilihan mingguan di Wikipedia Bahasa Melayu untuk minggu ke-44, 2009. Français : Cette image est sélectionnée en tant qu'image de la semaine sur la Wikipédia Malaisienne pour la 44ème semaine de 2009. Magyar: Ezt a képet a hét képének választották a maláj Wikipedián 2009 44. hetében. Italiano: Questa immagine è stata selezionata come Immagine della settimana su Wikipedia in malese per la XLIV settimana del 2009. Nederlands: Deze afbeelding is gekozen als afbeelding van de week op de Maleisische Wikipedia voor week 44 van 2009. Русский: Эта иллюстрация была выбрана изображением недели в малайском разделе «Википедии» для недели номер 44 2009 года. Svenska: Denna bild är utvald till veckans bild på Wikipedia på malajiska, vecka 44, 2009. Tiếng Việt: Hình này đã được chọn làm hình ảnh của tuần trên Wikipedia tiếng Mã Lai trong tuần thứ 44, năm 2009.
, Vol. 36, No. 4). From Pearl Harbor to Elvis: Images That Endure. Retrieved on 2007-01-02.